Once in a while, a customer asks how they can block caller ID on outgoing calls in Lync/Skype for Business. If they're interested in blocking caller ID on all calls, then the answer has always been simple: use the Alternate Caller ID field in Voice Routes. Easy enough, right? But what if administrators want to give users the ability to selectively block caller ID at the individual call level? When on the traditional PSTN, users in most places can enter a code prior to dialing the number if they want to block their caller ID. In most North American markets, this code is usually *67. So, a user could dial *6715552224444 and their caller ID would be blocked for that call. In Lync/Skype for Business, you can replicate this functionality but it takes some work. Since the caller ID blocking feature is done at the route level, you will need to have a separate route for calls with an alternate caller ID. For calls to use that route, you will need some unique signifier that would not occur in normal day-to-day dialing. Since the caller ID block code you use on the PSTN should be unique, you can incorporate that into your dialplan, routes and trunk translation rules. When I first tried this, I wanted to use *67 in my dialplan, but the Lync client didn't like the * so much. It threw up the virtual equivalent of giving me the finger and refused to work, so I had to go about it differently. Thankfully, things have improved recently so that the Skype for Business client will happily accept the * (or # if you want). My earlier version of this blog post simply put the *67 in front of the number and sent it through the system, stripping the *67 just before sending off to the PSTN. Kevin Bingham from Cerium Networks suggested it might work by adding a custom parameter suffix, such as ;callerid=blocked (custom parameters are allowed by RFC3966). So, after a bit of trial and error, I managed to make it work. This method is much nicer as it conforms to the standard RFCs and is fully E.164 compliant. Also, when someone types *67 and a number, it normalizes without showing the parameter suffix, which looks nicer to the user. Here's a simplified example using the North American dialplan. 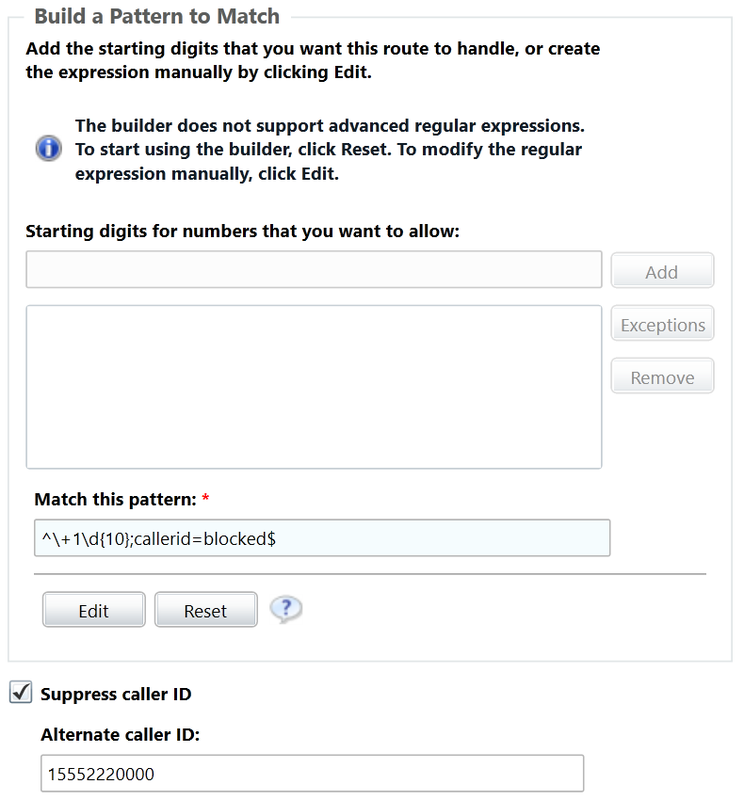 First, you'll need a normalization rule in your dial plan that will accept the caller ID block code. This will take any number that starts with *67 and is 10-digits long and translate it to +1 then the 10-digit number, followed by ;callerid=blocked. The client won't see this part of the normalization string. Make sure you assign the appropriate PSTN gateway to the route and add the voice route to the appropriate PSTN Usages. 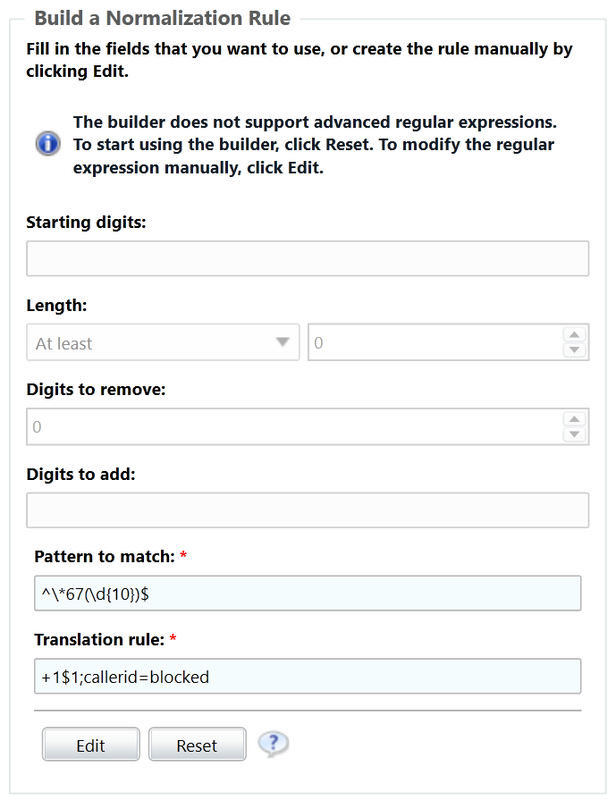 Finally, you will have to create a trunk translation rule on the selected trunk to strip the ;callerid=blocked from the dialed number before sending it out to the PSTN. I've tested this using the latest Skype for Business server and client (as of August 2015), and the 5.4 firmware on a VVX 600 as well as a CX600 deskphone. Let me know if this doesn't work on an older platform. I originally attempted this several years ago, and the Lync client (or server...can't recall), didn't deal with the *67 so well. Incidentally, you might have issues with the alternate caller ID not being sent. I've seen this on our own SIP provider. Checking the SIP traces, I can see that I'm presenting the alternate caller ID as a P-Asserted-Identity, which is the way it should work, so my SIP provider seems to be ignoring it. 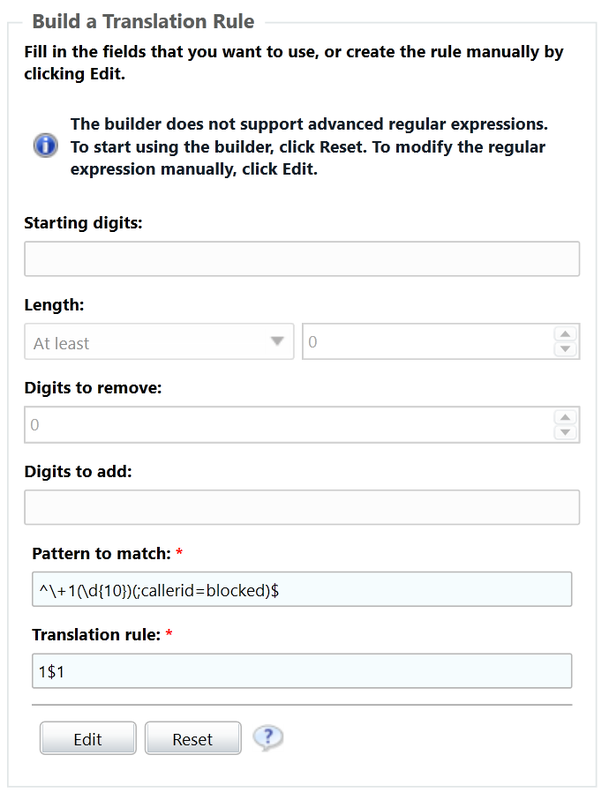 The example above used "callerid=blocked" as the custom parameter. You can name your custom parameter whatever you want as long as it is in lower case and uses the same format as ;parametername=value. Custom parameters have to also be placed after any ;ext= parameter. As you might expect, I've incorporated this functionality into the Lync Optimizer. Try it out and let me know how it works for you.